Last week I felt so worn out. I fell asleep at 8:30PM each night and I could not figure of why. My eyes would just start closing...I could not control it. I thought I was maybe not feeling well. 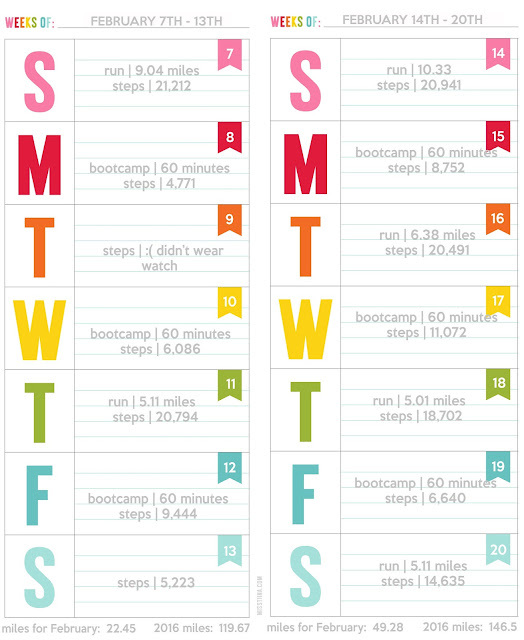 As I'm looking at my stats from last week, I worked out or ran everyday...whoa! There was so much stress at work I guess I felt like working out would make me feel better. No wonder I'm sore, and tired and sooooo hungry. While I love bootcamp, I had a hard 5 mile run on Saturday. I'm going to keep a schedule and stick to it and make changes for any training. I also decided no more working out on Fridays - Friday is now for relaxing and a standing date night with my husband. I am, however so proud of myself. But working out too much can cause injury, so I need to be a little careful. I hope you are having a great Monday.